Description: CSX Q621-04 heads north. Description: My first SD70I ever! Description: westbound waiting to go into the yard. Description: Settegast Hostlers bring out the QHONL-06's power. 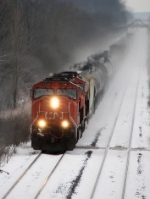 Title: CN 5608 at Mile 260 Kingston Sub. Description: CN 5608 comes around the corner at Mile 260, with some brake smoke evident as they slow to wait for a more favourable signal indication. Description: CN 5608 comes around the corner at Mile 260, with some brake smoke evident as they slow to wait for a more favourable signal indication. Nice to see a BCR unit trailing in Ontario! 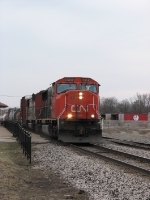 Title: CN 5608 at Woodstock. Title: CN 5608, with a missing numberboard. Title: CN 5608, with a missing numberboard, goes under Denfield Rd. Description: With this southbound, long-hood-forward light engine move coming straight out of the evening sun, a going-away shot was my only option.